Sidewalk Envy: Who's My Daddy? Family get-togethers, at least in our family, are opportunities for us to talk about other family members. Usually, it's about the ones that aren't there (that's why I try to get to as many gatherings as I can) or those who have passed on, who become the subject of conversation. My Aunt Bea passed away peacefully, recently, at the age of 94. During the reception that followed her burial, and I'm not talking a festive party-like gathering, but more of a "this was a long day and we're hungry" event, the topic of my father came up via my brother and another aunt who was in attendance. In conjunction with Father's Day, and these recent conversations, I thought it appropriate to present everything I know about my biological father. 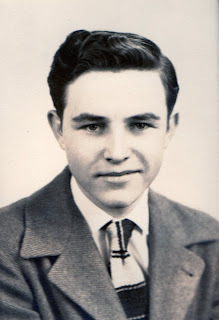 The picture here is what he looked like when he was about 18. He left me and my brother when we were about 3 and 2, respectively, in the questionably capable hands of our mother, to move out of state. I knew he was my father because that's what I was told and I do look a lot like him. And, his brothers and sister seemed to think he was my father. My mother's relatives used his name, when referring to my father, and my birth certificate lists his name as "Father." I once had someone stare at me to the point of total distraction, stating, "You must be Jack Cunningham's son, you just took me back 20 years. I went to school with him." Okay, didn't know the man. Hadn't even seen a picture of him. Until I was about 20, that's all I knew. I can't say that I missed him, as I didn't remember him. I thought it strange, as did many others, that my mother accompanied me to the "Father-Son" banquet for the cub scouts, but have since figured out that the "scouting" event put her in the room with a great number of men. Now I know why were late arriving, as she needed the time to over-primp. She was quite the attention getter there. I don't remember if I got any scouting badges or awards, but she did score a lunch date for the next day. Another reason I didn't have "dad envy," apart from never having or knowing a father, was that mother always had someone around to pick up that slack. When her male cousins, brothers and brothers-in-law weren't around to do the typical male-bonding things with us, like fishing, camping and yelling at us, her dating efforts provided us with a slew of gift-toting, kid impressing types, who kept her busy as she searched out her next soul mate. Oh, in my mother's context, soul mate equals someone to pay the bills. You see, apart from my real uncles, there were the "other uncles." "Uncle" Bob was a drummer in a band...that was his job. Now, there's a profession that speaks secure relationships, as one of the reasons my mother left dear old dad was her complaint that he spent too many hours in local bars. I don't think "Uncle" Bob was playing in the local symphonic orchestra...as the nearest one of those to us was two states away! He lasted a few years...seems his wife, from whom he was "separated," wanted him back. Those musicians!!! "Uncle" Lou was a phantom. Really! We knew he existed as there were notes and gifts and lots of comings and goings, after our bedtime. We were threatened with "no meals, no deserts, no movies, and no life" if we came out of our bedroom to see what this guy looked like. I thought he must have been so physically malformed that one might turn to stone, if you looked at him. Silly me. He wasn't deformed...he was just mean and married. Another "Uncle" was a shoe salesman. Another "marrying type," he took Mom to lunch regularly, bought me a sandwich once in a while, and managed to do this around working hours, before he had to rush home to the wife he was "going to leave." "Uncle" J had lots of little jobs. He swooned over our mother, but wasn't in the race for long. I was okay with his short attraction, as we got little more than a "hello" once in a while, and it was always uncomfortable when I was in school with my "uncles" children. Turned out another one of his jobs, besides not getting around to "leaving his wife," was swooning over other ladies about town. Mom couldn't handle competing with other girlfriends. A committed relationship, hey that happens, but sharing a date! No way!!! "Uncle" L was a really nice guy. He waited on our mother hand and foot. He helped her out with all sorts of issues, bought her stuff, gave us stuff, and was just a nice person. Problem? No wife, no money. Too easy, and not a good soul mate (see definition six paragraphs above). I digress...since those early years I learned that our father, who art in heaven (sorry about that, too easy, Catholic upbringing, and he did die over 30 years ago), ran from our mother. Her demands demanded that he get as far away as he could. He remarried, had another family, and was once again a father. He left behind a pair of cuff links. As Father's Day rolls around, I get asked by many about my father. I don't have much to tell and have been busy enough in my life not to dwell on him. I tell them what I know, thinking that they are referring to my biological paternal unit. One thing that did stick with me, through all of the years of questions, was that I did commit to myself was that, if I ever had children, I would stay in town or in touch no matter what. That's worked out wonderfully, as my wife and I are happily married for over 30 years and have three great children. But, due to the upcoming holiday and questions that keep popping up, I found myself looking up the definition of "father" in Webster's Dictionary, to help keep my thoughts straight...it states, "one who has begotten a child." Okay, dear old father did that. Based on that, he gets 100%. Hmmmm...so do I. Mystery solved! Who's my Daddy? Based on the definitions in this poem, not the begetter, and not the "uncles." Adjusting for gender, turns out my wife is my dad, and if you know anything of my family, stranger things have happened. Happy Father's Day to my wife!!! Ok.now I have tears in my eyes reading this. Oh.and by the way??? You are THE BEST dad ever!! Not sure about all of the Uncle aliases.... but the list I have is longer! To "Anonymous" re: the longer list of aliases, please share...I have short and long term uncle memory loss! Wow - Where's the book?